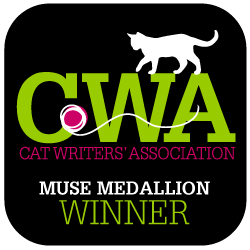 Disclaimer: Although I did not get paid for this review, the founder of CatLadyBox is a personal friend and fellow cat blogger. However, Paws and Effect only shares information or products we feel will be relevant to our readers. I’d been anxiously awaiting my CatLadyBox for a couple of weeks, with ever-increasing anticipation, as I tracked my package along its cross-country journey. And when I opened it, I found that it was totally worth the wait. 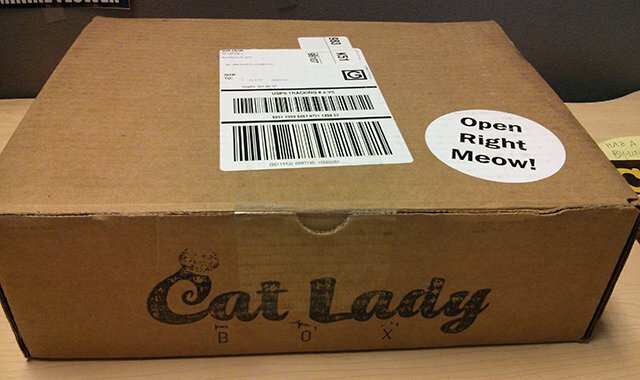 CatLadyBox is a subscription service that provides monthly shipments of two to three high-quality handcrafted cat-oriented items that can’t be found in retail stores. Some of the items’ creators also include discount codes for people interested in buying more of their products. The first item I saw was this card, designed by fellow cat blogger and artist Bz Tat of Bz Tat Studios, which contained a description of the items in the box. Thomas checks out the box contents. The biggest item in the box was a high-quality, heavy-duty Living in the Meow canvas tote bag, created by Living in the Meow, a company that creates apparel and accessories for cat lovers. It was sewn and screen printed in the San Francisco Bay Area, and it’s just the right size for a grocery run or for carrying my laptop to my favorite “remote office” to work amidst the hiss of espresso machines and the hubbub of conversation. This tote bag has a retail value of $28, and it came with a promo code that offers 20% off my next purchase from the Living In the Meow website. 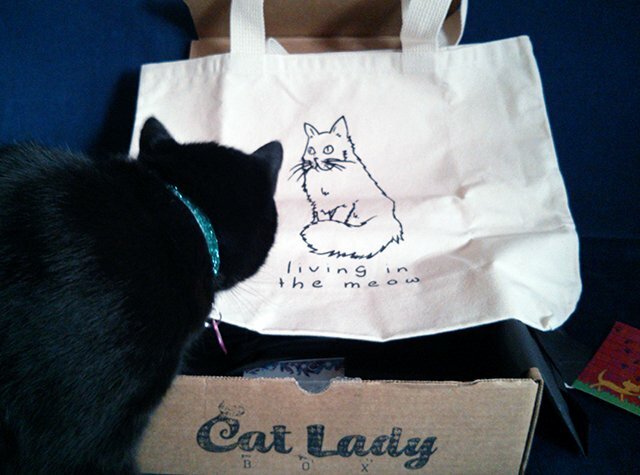 Bella checks out the Living in the Meow tote bag. Under the tote bag were two equally awesome items: A handmade cuff and a mini-spritzer of Black Cat perfume. The Crazy Cat Lady hand-stamped aluminum cuff was made by Marlayna Jackson of Designs By Marlayna, exclusively for CatLadyBox. Working from her Ohio home, she creates jewelry that has personal meaning for her customers. The cuff also comes with a promo code for a 15% discount at the Designs By Marlayna Etsy shop. The retail value of the Crazy Cat Lady cuff is $14. The Black Cat artisan perfume is made by Wylde Ivy. Scent artist Ashlee Kramme loves to create unique scents, and Black Cat is just that: Dark and mysterious, captivating and spellbinding, this perfume has elements of black vanilla, exotic spices, white patchouli, and musk topped off with a hint of sugar dust and jasmine petals. Delicious! And quite alluring to wear. The mini spritzer has a retail value of $4.25. Black Cat perfume and Crazy Cat Lady cuff. 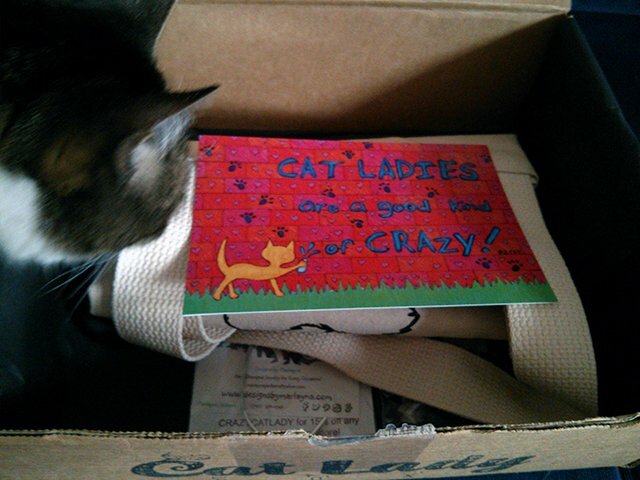 Finally, the box contained a note from CatLadyBox founder Dorian Wagner introducing herself, her cats, and the products in this month’s delivery, as well as a couple of small temporary CatLadyBox tattoos. Bella had to take the first sniff. Considering that the retail value of the three items in the box is $46.95, I’d say saving $12 to have three awesome cat-oriented gifts delivered to my door is a win all around. I’m particularly glad that the box doesn’t contain a single piece of what I call “Holly Hobbie crap” — the cutesy, twee kind of cat lady stuff that really marks you as a crazy cat lady, and not in a good way. 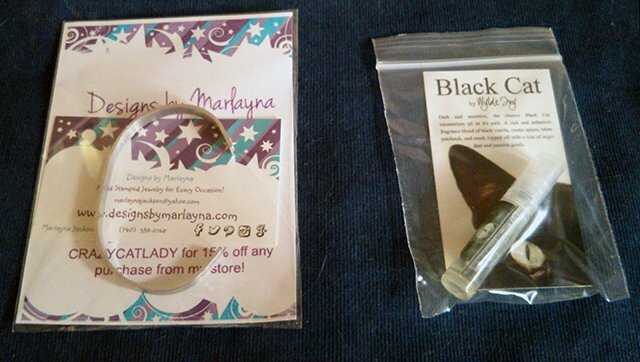 You can feel good about subscribing to CatLadyBox because Dorian will donate 5% of her profits to cat rescue groups. 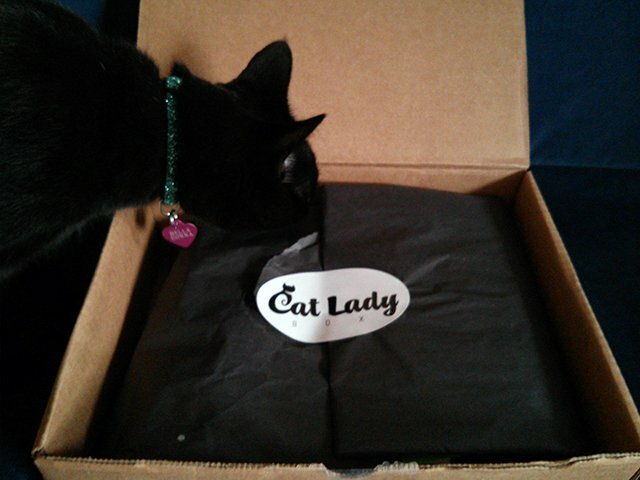 If you want to spoil yourself, CatLadyBox is a great way to do it. And yes, you can buy CatLadyBox subscriptions as gifts for your cat-loving friends, too. I’m looking forward to what Dorian will find to include in future CatLadyBox shipments. My review: Four Paws Up! Will My Cats Ever Be Friends Again? Will My Cat and Dog Ever Get Along?